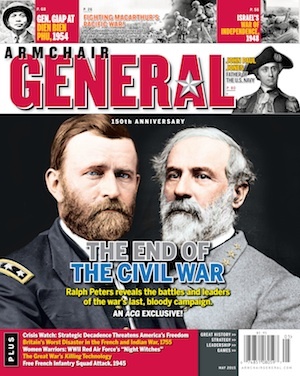 Lest We Forget | Armchair General Magazine - We Put YOU in Command! Those of us who write history, and those of us with previous military service need no reminding of the meaning of Memorial Day. Nearly 4,500 Americans have been killed in Iraq between 2003 and 2012. In Afghanistan the losses now approach 2,000. Some have been killed by Afghan soldiers they were there to help. Among the victims are two Army field grade officers killed while sitting at their desks in a secure building in Kabul. However, the majority of American deaths appear to have been from IEDs. Sadly, Memorial Day and death go hand-in-hand. With American lives and those of our NATO allies on the line 24/7, the occasion takes on added significance, just as it does each and every day this country is at war. Attempting to assess where we are and where we are going in Afghanistan depends upon whether one is a politician, general, or an ordinary American confused by the daily hype. The politicians, as they are about virtually everything else, are split over the war and when and how it should end, while the generals, if they value their jobs, are optimistic. As for the rest of us, the recent violent demonstrations in Chicago seem to be the tip of an iceberg of a growing national dissatisfaction with the longest war in American history. Since Hastings wrote this article almost nothing has changed. The Taliban seem able to strike at will. IEDs routinely kill and maim military and civilians alike. The Afghan government of President Hamid Karzai remains as corrupt and distrusted as ever, and an endless war seems destined to have a profound and lasting effect on a generation of dedicated young men and women who have valiantly sacrificed life and limb in a questionable cause. I have felt for a long time that the worst failure of the U.S. government, which of course drives everything the West does around here, has been to allow military operations in Afghanistan to dominate policy, chiefly because Washington cannot figure out what to do about Pakistan, which matters much more. It is not that the Americans have the wrong Pakistan strategy ― they simply have none at all. Since the publication of Mr. Hastings’s article over a year ago there remains no viable ending to the war and our relations with Pakistan since U.S. Navy SEALS killed Bin Laden remain more fractured than ever. Just as was the case for a decade in Vietnam, the great Washington spin machine routinely tells us about “progress” and “winning” and how they are keeping the world safe from terrorists whose central threat of late is less from the small numbers left in Afghanistan (thought to be less than one hundred) than from the dysfunctional and al-Qaeda infested nation of Yemen. FBI Director Robert Mueller recently called al-Qaeda in the Arabian Peninsula (AQAP) America’s gravest terrorist threat. It is no small irony that there exists in Afghanistan a disparate clash of 21st century technology employed in a nation in many respects still mired in the 8th century, where, like Vietnam, small numbers of armed men can often wreak havoc against incredibly superior numbers armed with the latest in sophisticated weaponry. Such is the state of the war in Afghanistan in 2012. It merely serves to drive home the unpleasant reality of a war where even our much trumpeted counterinsurgency strategy has been but a thumbprint in a conflict in one of the world’s harshest places. At least we’ve been spared the dreadful “light at the end of the tunnel” and “hearts and minds” analogy too often pronounced in the past by Washington spinmeisters. With America again fighting an uncertain war, Memorial Day takes on added importance. The malls will be filled with shoppers and I wonder just how many of those shopping in Wal-Mart, Macys, Best Buy, and in myriad other places across America will even know why they are being blessed with an extra-long holiday weekend. Cynic that I am, I suspect very few. At 3:00 p.m., the hour set aside to officially commemorate the fallen with a National Moment of Remembrance, I will again ponder how many people will actually stop to reflect on the sacrifice made by so many so that the rest of us could enjoy our freedom. I understand the apathy but I don’t have to like it. And so, on this Memorial Day we again remember and honor the men and women of our armed forces who, throughout our history, have selflessly given their lives in the line of duty. At cemeteries throughout the nation and overseas, American flags will be planted next to the graves of our fallen, solemn ceremonies will take place to mark the occasion and, one fervently hopes, they will never be forgotten. Lest we forget is a phrase that should be part of our national creed. Those of us not at the sharp end of danger must make it our mission to keep that pledge on behalf of the nation – and for those that don’t acknowledge that Memorial Day is not just another day off. When looking for the reason why things go wrong, never rule out stupidity. The insane wars the Bush administration started only served the military-industrial complex which is now worldwide. Has anyone noted the real reason of Vladimir Putin’ s reelction in Russia? The conservative republican president General Dwight Eisenhower warned of the rise of the military-industrial complex. This was in 1959. The key idea here is that certain industries want to loot the taxpayers and run off to their offshore tax shelters.